Who would true valour see, let him come hither. One here will constant be, come wind and weather. There's no discouragement shall make him once relent, his first avowed intent, to be a pilgrim. John Bunyan, Pilgrim's Progress. According to the Oxford English Dictionary, a pilgrim is simply someone who is on a journey, a person who travels from place to place, a wanderer, an itinerant. 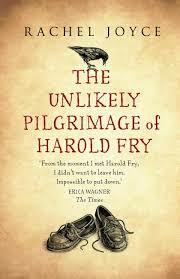 In Joyce's novel the somewhat unlikely pilgrim is recently retired and hen-pecked, Harold Fry. He sets out fully intending to post a get well card to a former work colleague who is dying, and finds himself striding past the local Post Office having decided to deliver it by hand, and by walking the 500 odd miles form Kingsbridge in Devon to Berwick upon Tweed! The walk gives Harold plenty of time to think and review his life. Indeed that seems to have been the motivation for the tradition of religious pilgrimages throughout the centuries. Such thinking nearly always brings a mix of regret and gratitude and can result in a new determination to do something worthwhile with one's life. The very act of walking was indeed Harold's attempt to make sense of his life and to bring relief, healing even, to someone else. "My aunt's got cancer. I mean it's everywhere. You have to keep positive though.". Harold stopped eating his burger and mopped his mouth with a paper serviette. "Positive?" "You have to be believe. That's what I think. It's not about medicine and all that stuff. You have to believe a person can get better. There is so much in the human mind we don't understand. But, you see, if you have faith you can do anything." Harold gazed at the girl in awe. He didn't know how it had happened but she appeared to be standing in a pool of light, as if the sun had moved and her hair and skin shone with luminous clarity. Maybe he was staring too hard, because she gave a shrug and chewed her bottom lip. "Am I talking crap?" 'Gosh no, not at all. It's very interesting. I'm afraid religion is not something I ever quite got the hang of." "I don't mean like religious, I mean trusting what you don't know and going for it. Beleiving you can make a difference." She twined a strand of hair around her finger. It's interesting how even in such a gentle conversation, 'religion' is contrasted with believing you can make a difference, and even contrasted with 'faith'. Perhaps like most novels written by secular authors, the only kind of religion that surfaces is either hypocritical churchgoing or fanatical obsession. And yet the Christian life is a pilgrimage, a journey of gratitude, not an attempt to find favour with God. It's a gift of grace. Indeed I think if we believers were more attentive to God and his Holy Spirit, in our regular, day by day life (on the Frontline as Neil Hudson of LICC would say), we might live life more as a pilgrim with adventures on a par with Harold Fry! I'm not suggesting the novel is good theology, but it does remind us that life can be an adventure. And it points us to a more reflective life, in a way that is quite counter-cultural. The so called fast pace of life is almost universally encouraged and fostered (think of the millions who listen to Chris Evans on BBC Radio 2 in the mornings, or who watch the Apprentice). As Simon and Garfunkel would say, 'Slow down you move too fast'.